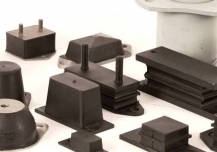 We can offer a wide range of designs to suit your application, from conventional bonded rubber bushes, pedestal mounts, bump stops and rubber springs to bespoke designs. We specialise in rubber-to-metal bonding technology and the use of natural and synthetic rubbers. 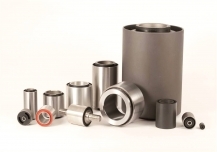 We offer a wide range of bushes for a variety of applications. Bushes can be used to accommodate loads, reduce shock, correct misalignment and manage vibration across many industrial situations. 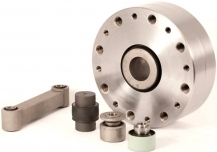 We manufacture a range of coupling types, including flexible couplings, coupling ball joint bushes, link arm assemblies and power take-off couplings. 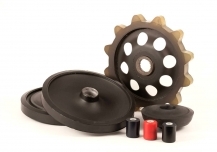 Rubber mounts are an effective anti vibration solution for various applications including compressors, engines, gearboxes, fans, instrumentation and generators. Buffers are an ideal solution for Shock isolation and limit stops. 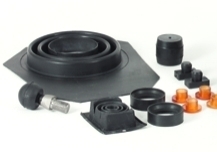 We manufacture a variety of products in this range, and also offer a refurbishment service for wheels, including those from tracked vehicles.